With seven weeks remaining until Vermonters go to the polls, Gov. 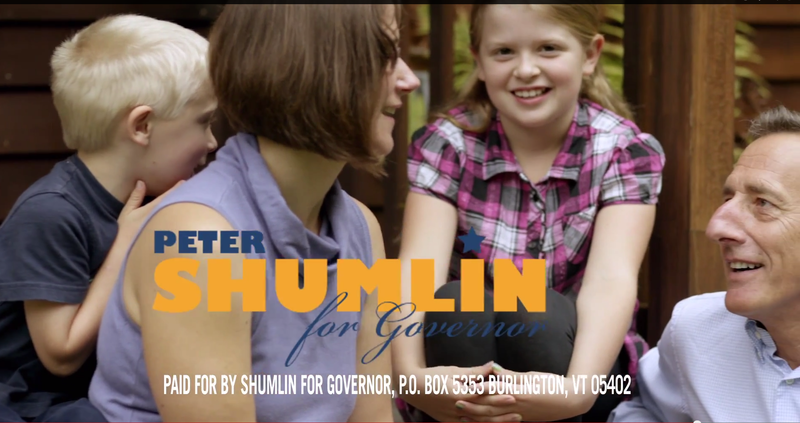 Peter Shumlin on Wednesday aired his first television advertisement of his campaign for a third term. The 30-second ad, called "Working Hard," began running statewide Wednesday, according to campaign manager Scott Coriell. He would not say how much the Shumlin campaign spent on the ad, nor how long he expected it to stay on-air. "I'm not going to get into details about our media strategy," Coriell said. "As you know, our campaign finance filings will provide information about our expenditures." Notably, the gov's first TV blitz comes a full month earlier in the election cycle than in his 2012 race for reelection. Then, he waited until October 17 to grace the small screen. This year's inaugural ad features several Vermonters vouching for the two-term Democrat's work responding to Tropical Storm Irene, increasing the minimum wage, reducing the cost of college and combatting opiate abuse. "I just think Peter Shumlin is working hard for an even better Vermont," says one of its stars, identified as office manager Erin Regan. Shumlin wasn't the first candidate in the gubernatorial race to appear on-camera. Republican nominee Scott Milne launched his own ad a week before his August primary election, though it has since stopped airing.